The Series 39F Large-Diameter Slurry Duckbill Check Valve is designed to handle abrasive slurries, sewage, sludge and other difficult services. The valve’s operation is silent and non-slamming, just like the smaller Series 39. At the heart of the Series 39F Duckbill Check Valve is a fabric-reinforced, Tideflex elastomer check sleeve that provides thru-flow at minimum pressure drop across the valve at all times. Forward pressure opens the valve automatically; reverse pressure seals the valve. The check sleeve even seals around entrapped solids. 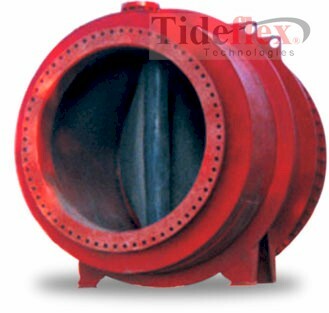 This inner rubber duckbill check valve minimizes wear and deterioration caused by continuous operation of abrasive slurries. And there are no mechanical parts such as hinges, discs or metal seats that can freeze, corrode or bind valve operation. The Series 39F In-Line Duckbill Check Valve is provided with a clean-out ports and flush ports for routine maintenance and cleaning. The valve features an epoxy coated, fabricated-steel body. The valve has thru-drilled flange holes; face-to-face dimensions meet ANSI B16.10 specs. The Series 39F is also available in a Plain End x Plain End configuration. The Series 39F has also been specially fabricated with offset flanges and TF-1 sleeve when bottom clearance is limited (consult factory for special configurations). When ordering, line pressure and back pressure must be provided as each valve is custom-built to match the flow requirements of the installation.